Some people are great at building muscle memory. I am not one of those people. 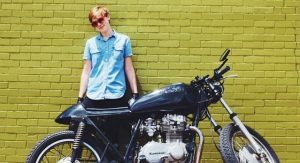 Although I knew I wanted to ride a motorcycle from the moment I first let off a clutch, I got overwhelmed easily and panicked often. In my first day at motorcycle class, I dropped the bike half a dozen times. At first, I thought there was something wrong with me. Was I not cut out for riding? Of course, I did overcome my panic and learn to ride. Since then, I’ve met many new riders who are like I was: they long to learn to ride, but have a hard time acquiring the basic skills. Can I learn to ride a motorcycle if I’m nervous? Some may tell you that if you’re scared of riding, you shouldn’t do it. And I see their point: riding is a dangerous hobby that doesn’t tolerate incompetence. However, I think it’s misguided to exclude new riders just because they have a hard time learning. For others (myself included), these skills don’t come so easily. In fact, I used to consider myself clumsy. I was constantly bruised, I avoided any kind of sport, and even after years of dance lessons I still had a hard time picking up new choreography. However, learning to ride a motorcycle taught me that my body is capable of much more than I gave it credit for. I just had to figure out the right way to learn. As far as I’m concerned, anyone of sound mind and body can learn how to ride, even if they struggle their first (or second) time on the bike. All you need is the commitment and patience to learn one step at a time. Okay, so it’s not groundbreaking. However, thinking about the individual steps of learning to ride helped me realize that I didn’t have to learn everything at once. And, more importantly, I actually learned better when I only tackled one new skill at a time. 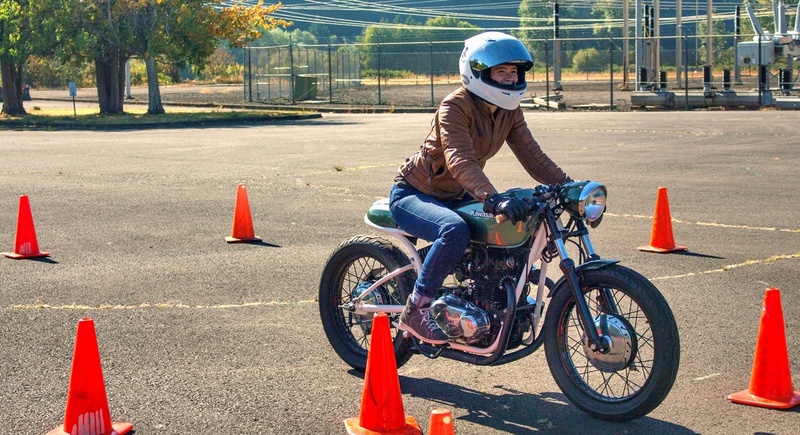 For most people, learning to ride means going out to a big, empty parking lot with a (hopefully small) motorcycle. All at once, they try to learn to work the controls as well as how to maneuver and balance. People who find it easy to pick up physical skills might not have any trouble learning this way. But for me, simultaneously learning how to balance and work the controls sent my panic into adrenaline-fueled overdrive. Not only was this extremely frustrating, but it wasn’t safe. However, when I switched to learning to ride a scooter, a new world opened up for me. The scooter’s lighter weight and simpler controls allowed me to focus on learning the physics of two wheels. Once I had learned to balance, I ventured out and learned how to be a two-wheeled vehicle on the road. After becoming comfortable with my scooter in a variety of situations, it was much easier for me to add the final piece of the puzzle: operating the controls. How should you learn how to ride? My journey to learn to ride was atypical, but it worked for me. And, I’m glad it did, because it’s shown me that there’s more than one way to learn to ride. The important thing is not to focus on the motorcycle itself, but to become more comfortable with how riding a motorcycle feels. The more time you give your mind to acclimate to each new sensation, the easier it will be for you to learn the next skill. In fact, research has shown that learning new skills in different ways (and giving yourself time for those memories to cement) can help you pick up new physical skills faster. If you’re struggling to learn to ride on a full motorcycle, I challenge you to simplify the problem. Maybe try a lighter motorcycle, and ride it around a parking lot in only first gear. Or get your hands on a scooter and practice on it for awhile. But you could go even simpler than that. You could practice on a bicycle, and pay attention to how it moves in response to your inputs. Even visualization can help: studies have found that visualizing yourself doing something can help prime your brain to actually do it. Whatever you choose, remember that the goal is to find accessible challenges. If you push yourself too hard, you’ll end up back where you started: anxious and frustrated. But if you take it slow and steady, you’ll be riding effortlessly before you know it. The first few months of learning to ride are possibly the most dangerous time in your riding career. So remember, you’re playing the long game. The object is not to get up and running on a bike as fast as possible, but to make sure you can stay on the the road for as long as possible. Even after you attain basic competence on a motorcycle, there will always be room to grow. It’s tempting to think that once you’re comfortable on the street, you’re done learning. But the skills you need to ride defensively go beyond the skills you need on a routine trip to the grocery store. So, though it might feel like your goal is to get comfortable on a motorcycle, that’s actually only a checkpoint on your journey. Learning to ride is a lifelong endeavor, and by keeping that in mind from the start you’ll position yourself to have a long, happy riding career. If there’s anything I can do to help you along your journey, please don’t hesitate to ask. Enjoy the ride! On the hunt for your first motorcycle? Here’s what I wish someone had told me. I’m writing this note with a significant degree of trepidation. I believe friends (which I consider you to be) can be honest with each other as long as that honesty isn’t wielded like a blunt object or worse disrespectfully – neither mode is my intention. I think the piece by Christian Jarrett reads like a dismissive oversimplification. I acknowledge that I do not have a degree in psychology nor education; but I have taught children and adults here in the states and overseas, and I have two school-aged children who have had teachers that run the gamut of the teaching spectrum. I don’t know that we know, nor will ever know, enough to dismiss the concept of learning styles as mythology; but that is not an outright endorsement for them either. Experience on either side of the teaching lectern has shown me that a combination of the level of energy, time, and attentiveness the instructor is able to provide (which is of great disparity in classrooms and schools across the globe) in concert with the respective background (of equal disparity) of each student can yield results that feed into a perceived response – accurately or not – to different learning styles. I have no empirical data to support my position; and I acknowledge that the concept of learning styles – all things being equal – could be a myth; but, as you know, things in life are seldom equal. And yes, of course, taking an approved, official course should go without saying! However, for many people one weekend on the range isn’t going to be enough to get them comfortable on the road (ahem: me haha), and that’s who this was written for. LT, I think Christian Jarrett should pin your response to me to the bottom of his article as an epilogue everywhere it’s published. I cannot disagree with anything you just wrote. Thanks for the different / clarifying perspective. I learned to ride the bike with the “old school” system, I got on the bike without knowing anything, I learned in 2 minutes, at least the basics, the most advanced skills I learned with time (like dodging a minivan coming out from a stop without looking forcing you to go in the wrong direction while a bus is coming, even dodging that). Maybe I lost it, but a capacity that I find fundamental is the “reactivity” of the body’s response, it has saved me more than once. Hah, no worries! You *can* learn to ride that way, but it’s not the safest 😉 I do like that saying though, I might have to steal that from ya! I’m just learning to ride and today was my first class. I got overheated (I live in Florida and it was 93 and humid), frustrated, and panicking. I never dropped the bike and was making progress by the time I was just too tired and dehydrated to go on. I know the right way to mount, start, stop and shift. I just bought a 2018 kawasaki vulcan 650 and thinking I could just learn in one weekend. I am very disappointed with myself that I dont learn as quickly as the others in class. I just wanted to say that I appreciate you sharing your story! I know I will get my endorsement but not as quickly as I wanted to. Half of my class could be my kids because they were so much younger than me. Thanks again for sharing and will definitely subscribe. I just came back (and have finally calmed down) from day 1 of a 2-day learner course having fallen off twice, and was asked to take a pre-learner course before I resume the course I enrolled in. I realised as soon as I couldn’t get the hang of stopping without stalling I wasn’t going to get it in two days. I really appreciate that you shared this on the internet, as I thought that I was overreracting when I got frustrated and worked myself up to a crying mess about not being able to learn to stop properly. I’m definitely not going to give up on the idea of eventually being able to ride a motorcycle, I just need to tell (and remind) myself that I just need to take more time and more practice in getting the hand of it. Oh, Hanna, I feel your frustration! I’m so glad this helped you out. Learning to ride a motorcycle is overwhelming, there’s a lot to take in, and your brain has to learn a completely different way of moving. Just because you aren’t going to be able to learn in two days doesn’t mean you can’t do it! I love the idea of a pre-learner class to give you the extra attention you need, and you’ll be a safer, better rider for it. Remember to hold in the clutch as you come to a stop, and a scooter is a great intermediate step that can help you get more comfortable with being on two wheels without having to worry about a clutch at all! Once you’re comfortable on a scooter, your mind won’t have so much “new” to process when you try a geared bike again. It’s good to see this. I committed a real act of idiocy a few days ago and financed a Suzuki dr650 dualsport motorcycle. I have never driven a manual transmission vehicle or dealt with a clutch before. I am an avid mountain biker and figured (foolishly!) that learning to ride a motorcycle would be easy for me. I did a few years of research to decide that I wanted the dr650 model, but I had never attempted to actually ride one. I’ve signed on the dotted line and am on the hook for the full cost of the bike now. I got it in the truck and drove it home with the intention of just running it down the driveway (I have a 1 mile long gravel driveway) a few times before taking the MSF course later this week. Dear god, I had no concept of what I was trying to do here and how terrifyingly, lethally dangerous 45 horsepower can be. I laid that brand new dualsport down three times, injuring my leg on the last time. Out of 50 attempts, I think I got it actually moving in first gear 5 times. I dropped the clutch time after time, it was a real trial by fire for me. Like getting moving on roller skates and not being able to stop. Already, from day 1, I realize that I should have started on a 250cc or something and that when they say a bike is “torquey” they mean that it will try to leap out from under you if you give it too much throttle from a dead stop. I walked away with a new fear of the throttle and frustrated nearly to the point of tears with the thing. Luckily, it is a tough dualsport and the bike is no worse for the wear with just a few scratches here and there. I plan to take the MSF course before laying hands on it again. But I suspect that still, it won’t be nearly enough for me to feel comfortable on it. I completely underestimated the difficulty of learning this and all I can think of is what a huge mistake I have made. Hopefully, further practice and learning will help me overcome my first impression of the bike I have purchased as an outright killing machine. Caveat emptor. So sorry to hear about your first experiences, Nick! I hope your leg is doing alright, but I’m glad that your injuries weren’t worse! Yes, please do take a class, I think you’ll find it much easier to get to know a motorcycle in a controlled environment than out on your own. I hope you feel better about your DR after taking the class! If not, a DRZ400 might be a good moderate step down while still giving you plenty of room to challenge yourself and grow as a rider. My husband is torn between the two bikes at the moment, either is a fine moto! They also make a DRZ250, and Team Oregon (the organization I instruct with) has a few on our training bike fleet! Remember that the best motorcycle for you now is one you feel comfortable on. Thanks for writing to share your experience, Nick, I really appreciate it. Best of luck with the class! I hope it helps you re-set your riding journey and go down a safer, more confident path. Recently picked up a motorcycle, with the plan of it being an easier (and more financial viable) commuter. So far, in the month or so I’ve had it, I’ve managed coaxing it around the back of the house about eight times, for about five feet forward each time. Yeah… I may have underestimated the complexity of it, considering I’ve never been much for automobiles in the first place. We’ll leave out how many stalls, and gloss over an awkward error… where I had something of a panic and almost dropped it – and instead of dropping it like an infinitely wiser man would have, I decided keeping my new shiny from getting scratched was too important annnnnd… caught the full weight (415lbs) on my right leg, plus another 185lbs of my own weight. Turns out, I’m not 18 anymore and pulling that kind of stuff HURTS. Welp. The bike remains scratch free, and my knee has almost stopped aching, almost two weeks later. I’ve had some anxiety over it since, but have gone back to baby steps; slow roll outs with the clutch, testing my balance, etc. It may sound ridiculous, but most of my anxiety comes from not wanting to look as green as freshly mowed astroturf when I attend my basic rider course in a little over a month from now. I guess, pushing 40 (not a mid-life crisis, gtfo…), I’m worried I’ll look like… some old guy having a midlife crisis, heh. Think it’s worth it to keep puttering around like this, or should I just hang it up until the course? I’d rather drop their bike than mine, but my elaborate and complex manly pride doesn’t want to look like a clown in front of a bunch of kids, either. I really liked the article, and for whatever reason, I felt compelled to kind of… dump all this in your comments, in case some other almost-old-folks out there happen find it while going through the same thing I am. I guess it’s nice knowing I’m not the only person going through it. Some of these comments were a real comfort, so thanks to everyone brave enough to come out about it… and my support to everyone else having a rough time of it. Oof, sounds like you’ve had a rough go of it so far! I’m glad you liked the article, and so glad you connected with the other commenters. Learning to ride can be overwhelming, and you’re definitely not the only one who has struggled! In my limited teaching experience so far, if a student doesn’t “get” where the friction zone is, they struggle to progress for the rest of class. So, if you can get comfortable finding the friction zone on your bike now, you’ll be that much better prepared for class! I have to say what an excellent article this is! I just completed my basic training (a UK legal requirement), and had exactly the problems you describe. I found I could manage clutch control in a straight line, but introduce any manoeuvres into the equation, I completely fell to pieces! I didn’t drop the bike, but it was a near thing on several occasions! Fortunately, I remembered this article, recognised the difficulty I was having and switched to a scooter, and everything fell into line. I went on to take the road elements of the course on a scooter and passed no problem. If you have any readers in the UK, it is worth noting that if you do your CBT on a scooter, you are still legal to ride a geared bike on the road. This means you can learn a geared bike (as I have managed) on quiet roads / car parks until you get your confidence. I’d recommend this approach to your last commenter – no looking like a clumsy old fart in front of a bunch of kids! Hi! Reading your post has made me feel SO much better about my choice to work with a scooter first. I too am having a few hang ups here and there, especially with things that for now are feeling challenging and unnatural. My husband rides, and all he took was one safety rider course. He ended up waiting 5 years to get a bike, and then picked it back up with ease. For me, he keeps telling me about all of the things I will learn in the course, but I am choosing to practice on a scooter a few months before having to introduce shifting etc into the mix. I actually just ended up riding too close to a curb today and the kickstand got caught up on it at about 15mph. It went down and I jumped off. All is well, but I needed a boost to see that I’m not a complete idiot, and just because something happened, doesn’t mean I’m not cut out for riding in the long run. It’s only my 4th day on it so…. anyway, thank you for sharing! I’m so glad this post helped, Samantha!! Some people take to riding like they’re born to it, the rest of us have to learn by taking it slow and LOTS of practice haha. Good to hear you’re not hurt, just remember that you go where you look! Sometimes I still have to remind myself to look away from the obstacle. Hopefully after some good riding time with the scooter, you’ll feel more prepared to learn shifting and clutch control! Best wishes and ride safe! I am so glad I read this article. I know the basics and and had been riding on a smaller bike for some time. My husband took me to try his sportster 883 today. And out of 6 turns I dropped it on my 2 turn( we were on an empty road used for practising) .Though I continued riding and managed to make the turns without dropping it again I was so frustrated and just felt like its something I cannot do. My husband is a great rider. And just took up riding without any practise. He rides the Harley street glide and BMW R90 . He bought the 883 so we both could ride together. And he thinks I should now start on the 883. But I think it’s not coming that easily to me. This article has motivated me to keep going on. But I am still so upset on my fall. There are so many people riding so perfectly, you feel its doable but then you are not able to do it . It’s true, everyone learns at different speeds! Sorry to hear you feel pressured to ride a bike you’re nervous about riding. How comfortable do you feel on your small moto? In my experience if you’re confident on your smaller bike, the skills will translate to a bigger bike, because the dynamics of balancing are absolutely the same. If you’re not yet 100% comfortable on your smaller motorcycle, you might need more practice with it before moving to a larger bike, purely because it’s harder to learn on a motorcycle that intimidates you! But if you are comfortable on your smaller motorcycle, you might need to just take it slow and go back to the basics on the 883. Either way, stick with challenges you feel ready for, be patient with yourself, and keep practicing good habits!